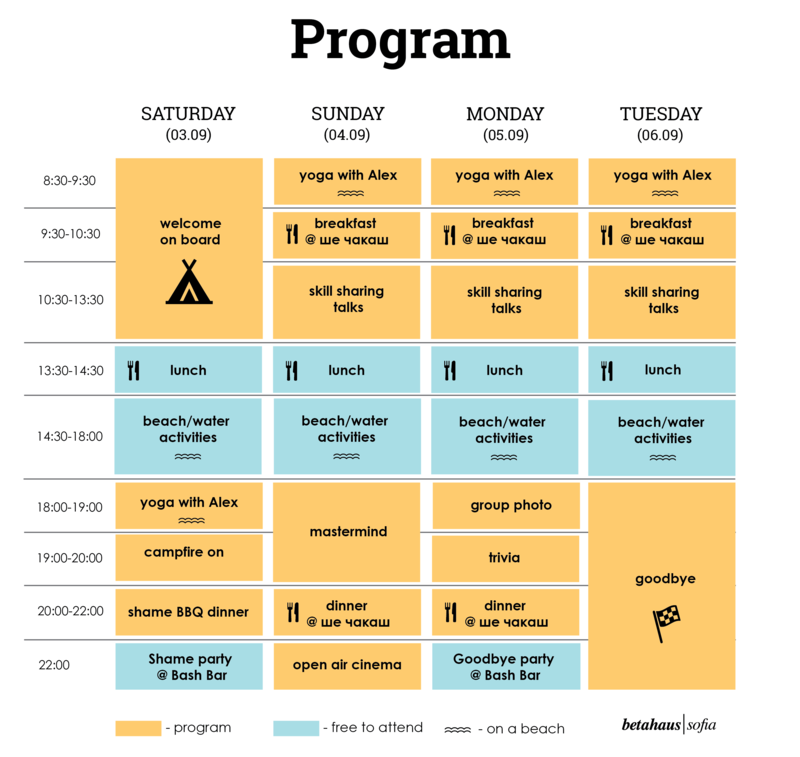 What is betahaus summer camp? An Unforgettable Four-Day Getaway at the Black Sea. Summer Camp is where the betahaus family and friends come together to connect, learn from each other and enjoy nature. It is a creative break from the city hustle and an opportunity to draw inspiration from new experiences and the community. 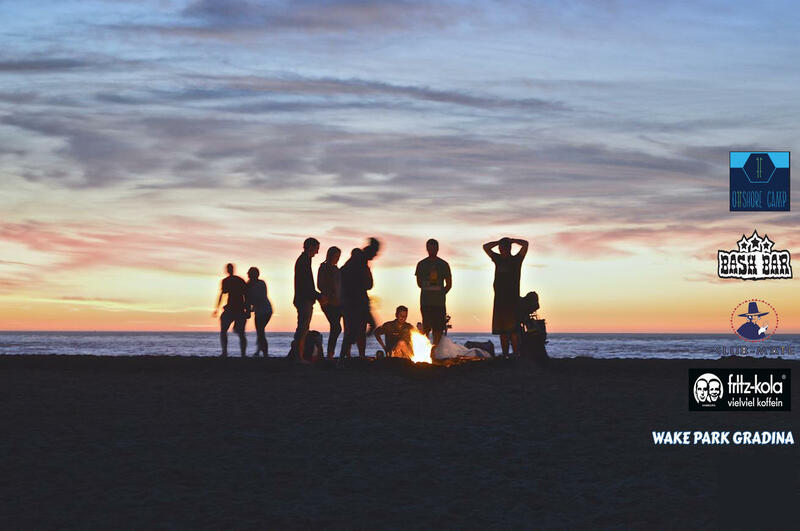 As a camper, you can attend group yoga classes, sports, games, networking activities, our impro-open air cinema, discounted water sports activities like wake boarding, windsurfing, kitesurfing, canoeing and of course sing along the guitar at our camp fire every night! Breakfast and dinner during your stay are included in your ticket price. On day one we will greet campers with a Welcome BBQ. During the rest of the stay meals are provided by the authentic beach restaurant “she chekash”. Pancakes - sweet or salty, french toast with jam, chocolate or honey, princess toast with minced meat or with cheese and egg, yogurt, fruits. Seafood paella, green salad with tuna fish, marinated pork neck with BBQ sauce with roasted potatoes, garden salad, french fries and meat balls, fish and chips, slow roasted spiked pork with patatoe mash. The ticket price includes 3 nights accommodation in a fully equipped tent just for yourself. The tents are provided by our friends from ''offshore camp'' in the woods behind the beach. kite surfing, wind surfing, wake boarding, SUP, cannoeing, etc. Transportation is not included in the package. You can car pool оr take the bus from Sofia. Please note there is parking available at the camp and in the surrounding area. Parking in the designated area costs an additional 5 BGN for your entire stay and is payable at arrival to the parking operators. There are toilets, showers, internet. Tents have blankets and pillows so no need to take a sleeping bag with you. Sunscreen, towel, warm layer for the evening, mosquito repellent and everything else you think will help you to enjoy 4 days at Betahaus Summer Camp. betahaus | sofia is the first coworking space in bulgaria, one of the largest in the region and part of one of the most successful coworking networks in europe with branches in berlin, barcelona, hamburg, and sofia. we have a powerful web of affluent partnerships with coworking spaces around the world, with global leaders in the financial industry and in media & technology sectors, with government and non-governmental organisations. betahaus | Sofia brings together the best from the creative scene in Bulgaria — startups, founders, freelancers, VCs and innovators — from all sectors to inspire and be inspired.